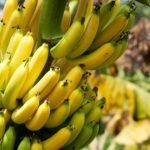 Do you know what kind of banana tree this is? I need help in harvesting. Could you please clarify the question? Are you asking what variety of banana you have? Knowing where you are located would be very helpful. Yes I'd like to know what variety of tree this is - I live in Austin, TX.